Seabourn Cruises and Caviar have always gone hand-in-hand. You have Caviar In The Surf. You have Caviar at the Captain's Reception. You have Caviar and Champagne delivered to your suite at 3:00 AM complimentary and with a smile. And on the Goldring Travel 2013 Food & Wine Cruise on the Seabourn Quest, we had an overnight stay in Montevideo, Uruguay...which is the home of Seabourn's exclusive caviar supplier: Black River Caviar. Caviar in Uruguay, you say? Yes. Seabourn has led the way with providing a luxury experience while being socially and environmentally responsible. (Yes, there are more ways to improve that...like selling off the smaller triplets and operating the more sophisticated and environmentally responsible Odyssey-class ships, but that is another topic!) In February 2012 I wrote an article on this: Seabourn's Sustainable Caviar - The Real Deal...Done the Right Way. I found out it was too far to travel to the Black River Caviar aquaculture farm where stocks of Caspian Sea, Siberian and other species of sturgeon from which caviar is harvested are raised. So as they say, if I can't bring my guests to the sturgeon I can bring the sturgeon to my guests. And from that the spectacular Goldring Travel Caviar Event was born. 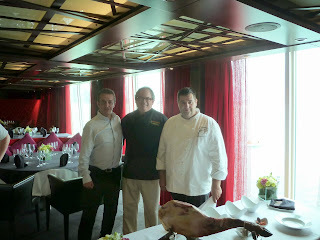 Our day started with a Private Shopping With the Chef, but we were honored by not one of Seabourn's Executive Chefs, but two: Chef Rafael Peterkovic and Chef Pasquale. While the shopping was not outstanding, we were able to see the "other" more upscale side of Montevideo while picking up some items for a special meal on our last night. It was then time for the Goldring Travel Food & Wine Event at Rara Avis, one of the finest restaurants in Uruguay. In order for the Event to have its best impact, I kept the specifics from everyone. All my guests knew is that at the Food & Wine Tasting onboard the Seabourn Quest, I gave each of them a black chef's jacket. To start the Event, a Champagne and Caviar Extravaganza with more caviar than you see on a Seabourn ship to be enjoyed by the spoonful and also served eight different ways. Don't ask me how they did this! But things were just starting! After explaining who Black River Caviar is and how they raise sturgeon in a socially and environmentally sound manner, it was time for the surprise: Everyone was going to assist in the harvesting and making of caviar! So with that Black River Caviar brought out four fresh sturgeon. After I explained the various interesting (at least to me) things about this unique and prehistoric animail, one by one each guest came to the processing table and touch the fish, its unique scales, its barbels and its toothless mouth. A 4 foot long sturgeon. That's what caviar comes from. Beginning the harvest of $12,000 of caviar. Chef Rafael tries his hand at harvesting the sturgeon eggs for making caviar. A once in a lifetime opportunity...and a lot of fun to see him enjoy the moment! Cleaning the sturgeon eggs with purified water. Cleaned eggs getting ready to be salted. Yes, that's right: It isn't caviar if the eggs aren't salted. In fact, if they aren't preserved with salt you won't have anything but rotten fish eggs! Salted eggs - almost caviar. Wait about four minutes and wash them again. Now the getting the caviar into the can. Did you think that much would fit into one can? Placing the caviar can into a press. Compressing it a little at a time allows the eggs to distribute with breaking. Caviar - The finished product. Look familiar to what you see on every Seabourn cruise? With caviar served eight ways completed and the caviar having been processed, our Event was not nearly over. It couldn't be because this is a Goldring Travel Food & Wine Event. Our meal was pared with two special Uruguayan wines: 2007 Familia Deicas Preludio Barrel Select Red (primarily Cabernet Savignon and Tannat) and Familia Deicas Preludio white. Oh, yes. I almost forgot: Dessert! When putting something together as sophisticated and complicated as it was, a huge Thank You has to be given to Black River Caviar and Seabourn. It was a tremendous event which was made only better because my guests were fantastic. They enjoyed every moment as was apparent from the smiles on their faces. Something to give everyone a bit of a smile: Goldring Travel has arranged with Black River Caviar to provide you with a discount on every caviar purchase made. All you need to do is sign up for Goldring Travel's email list (or, better, book a cruise or other vacation) and I will give you the discount code. You can sign up on the Goldring Travel Facebook Page, by emailing me at eric@goldringtravel.com or, of course, calling me at (877) 2GO-LUXURY.